Ebookifi is a professional eBook conversion company offering premium quality service to authors and publishers. Take your manuscript a step closer to success by converting it into any of the most widely used eBook formats. Enjoy the guarantee of having the most professional formatters convert your eBook from any file into a format suitable for Amazon Kindle (.mobi), Apple iBookstore (epub), Smashwords, and many more.. Sit back and relax as our experts work on your eBook files, converting them to your desired file type. Everything will be manually hand-coded to your desired file format. Electronic books are an increasingly popular publishing method. Initially recognized for their high-cost efficiency, eBooks continue to gain momentum for their ability to reach a variety of users around the world. Whether you already have a print version of your book or are looking to self-publish online, you need a professional eBook conversion service. At Ebookifi, we share your dreams of becoming a professional author in a fast, affordable manner. We offer you the only guaranteed way to convert your files into an eBook. We boast one of the industry’s best prices, hold ourselves to the highest of standards, and command the shortest turnaround time. Writing an eBook is demanding. You will research the contents, sift through your research, and combine the important points from your research. Every step of the way, your book requires a combination of understanding, logic, and finesse to ensure your message is passed to your audience. Finally, your book is ready. You have written, edited, and proofread it. In the past, you would send it to the publisher but not for your digital book. You still need someone to prepare your book for publishing. Before you publish an eBook, you must convert the file to one suitable for your platform. You could use one of the multiple free automation tools online for your conversion. Most of the time, though, the result is a clunky eBook that elicits poor user experience and affects your sales results despite your book’s great content. Most platforms refuse poorly converted eBooks, and Amazon Kindle wastes no time refusing any automated conversions. You can avoid this rejection and save yourself some time by hiring our specialists. At Ebookifi, we review individual eBook manuscripts because we want to give your eBook the perfect launch. We take into consideration the current file format of your eBook, the platform , and the different E-readers . We do not use automation services that turn up junk codes for your readers. Instead, we keep the book quality up, and the book size down by manually converting each file. 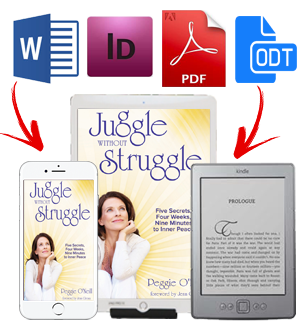 EBook manuscripts come in many different formats. From Word files to PDF files, we can convert any file format. Consider some file formats we receive Ebooks in (input), and some of the formats they are converted to (output). Of course, the output wholly depends on your needs. As English developed into a universal language, your eBook may appear in a totally different language. Different languages appeal to different audiences. At Ebookifi, we are ready and willing to help you with your conversion regardless of the language. We process eBook conversions in English, French, Spanish, German, Japanese, and Chinese among others. Our goal with every conversion remains the same —getting your eBooks to your readers in a user-friendly manner. Several elements must come together if this is to be achieved. While getting all the junk code out of your eBook is one step in the right direction, it is simply not enough. Cross-device compatibility is the goal of every eBook publisher. Our conversions ensure that you are able to achieve that goal, with your book compatible with every standard E-reader – from Kindle readers to iPads, Nook, Kobo, and Android devices. No automation program is used for your conversion process. We manually hand-code your eBook manuscripts using HTML and CSS codes that maintain your eBook’s originality. Professionals with extensive experience will handle your manuscript. From integrating equations to integrating chemical formula, poetry, tables, or Q&As, we will combine knowledge from training with our extensive previous experience dealing with such materials. We make all the source files for each conversion available to you at no extra cost, so you can make any edits any time you need. We provide you with ready to upload formats that do not need any further tweaks or adjustments before use, for iBookstore, Kindle, and more. We measure our files using the latest standards set by industry leaders IDPF and Kindle Direct Publishing Guidelines for eBooks. We also follow platform-specific checklists to ensure seamless publishing. Your eBook file comes in a variety of file formats. We work with all manuscript types and will convert whatever file you send us. Regardless of the size of your order, your converted file is ready within 72 hours. You only pay once for our services and have no reason to pay any royalties when our job is done. You keep all of your profits (100%). Our user-friendly website interface ensures an easy process for ordering. All costs involved are clearly laid out from the beginning so you have no hidden charges. Ebookifi takes convenience a step further by uploading your eBook on various stores. With your conversion completed, let us know if you need help getting the upload done. We can convert one manuscript file into multiple eBook file types for different publishing platforms. We are here to serve you. Feel free to contact us with any questions and concerns about the conversion process, and we will answer you promptly. Your final eBook output design will have a clickable table of contents that interacts with the content of the book. This will make for easy navigation through the book and make for a better all-around experience for readers. We provide active links and notes for your eBook, including active hyperlinks, footnotes, and endnotes that are clickable and interactive. You have probably selected your most preferred font style when preparing your eBook manuscript. If so, you want nothing more than to see this style retained in the final copy. You might also have a particular font in mind. We embed whichever font you want for your book so that the final copy retains the style you desire. We work on your metadata code to ensure that all the necessary meta info is included in the eBook after conversion. We format all included visual elements, resizing and optimizing them for better integration with the rest of the content. We format everything from images to charts, graphs, tables, photographs, and more. Our quality control team is always ready after every conversion to check for any errors or bad code. The final product is checked and double-checked to ensure it is of the highest possible quality. Our eBook publishing specialists make sure your published book is compatible across multiple devices. We provide you with a high-quality eBook file (in the file type most compatible with your platform) that can be viewed on all popular E-readers. The book you just converted for us was the fourth one we have published in both print and ebook format. Publishing the first three with other companies was problematic from both a price and technical standpoint. Our experience with Ebookifi has been much different. Right from the beginning, your website and bid process worked well and fast. You and I had progress being made on the book within a few hours of the first contact and everything proceeded well until we had great results in record time. I would like to express my sincere appreciation to you and your staff for the speed and quality of your work on my book. I was also impressed with the integrity of your payment process and with your guarantee. I expect to come back to you with future books and I will recommend you and your work to others. I submitted my complex 315-page self-help legal book (“How to Protect Your Family’s Assets from Devastating Nursing Home Costs: Medicaid Secrets”) to ebookifi last week and they completed the conversion on time. I immediately checked in the Kindle program and was extremely pleased with how it came out. All of the many table of contents entries (3 pages of them) as well as hundreds of index entries all worked perfectly! Very pleased with their communication, price, and results. I of course plan to use them on next year’s edition. – K. Gabriel Heiser – Attorney, Author, Publisher – Phyliuspress. Ebookifi was a wonderful service to work with. Not only was their work very clean and precise, they kept their deadlines to the day, and they responded to our request for a correction to our text without any hassle or objection. Their willingness to do what we requested was quite refreshing. We highly recommend PDF to Kindle to anyone who is looking for very high-quality conversions for their texts to ebooks. – John Powers – Editor, Theosophytrust, Washington, D.C.
Service, quality and speed are outstanding. I’ve used other conversion services and they were no match for the experience I’ve had using Ebookifi.com. I’m so glad I switched and I actually enjoy working with this professional team! Thanks! Ready to begin? Our ordering process is simple and quick. Find the service which describes your need, click, and follow the prompt. Your order will be completed and delivered within 72 hours. Please use the custom quote form if you have any specific requirements. You’ve already completed the most difficult part of eBook publishing —writing. Now you leave the rest to us. We know what your eBook needs to go from a raw manuscript to a publish-ready eBook your readers will enjoy reading. We want to get that great content of yours into the hands of readers as badly as you do, but we also want them to enjoy reading it like you enjoyed writing it. We provide you with everything you need to complete the process. Select which of the services below best fits your needs and follow the prompt. It is not uncommon to find a great conversion job ruined by the presence of one line of poorly written or wrongly placed code. It may only be one line, but it could affect a core functionality of your eBook. We do not want that for you. Some of our highly trained, dedicated staff at Ebookifi have been tasked with performing checks, tests, and debugging exercises to assure the quality of your eBook. With the conversion completed, we carry out a comprehensive quality assessment, testing the output file formats on some of the most frequently used E-reader devices. Any inconsistencies or errors noted are corrected before delivery. You too can be a part of our quality assurance process. As we run our tests, we record the results and send these to you so that you are a part of the proofing system. We want you as confident in your final output as we are, and we are glad to give you reasons to be. Your dream of becoming a published author can become a reality in no time. Come, let’s get your book published today! If you have any questions, we are here to help with an efficient and simple solution. All you need to do is contact us today, and we can begin preparing your eBook for professional improvement. If you have a specific requirement, contact us using the custom quote form.